Also Called: Pokeberry, inkberry, pigeonberry. 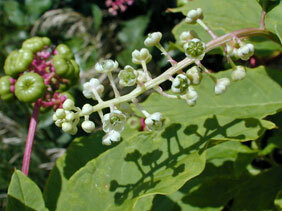 Stems: Erect, stout, reddish-purple, solitary or several, branching in upper half, glabrous. Leaves: Alternate, simple, on stalks 1/2 to 2 inches long, oblong-lanceolate to ovate, 4 to 12 inches long, 1.5 to 4 inches wide, reduced upward, glabrous, sometimes reddish-tinged; margins entire; tips pointed. Inflorescences: Racemes, 4 to 8 inches long, arching or drooping. Flowers: Stalks stout, 1/5 to 2/5 inch long; sepals 5, conspicuous, ovate, about 1/10 inch long, white or greenish-white to pinkish, darker red or purple in fruit; petals absent; stamens 10; stigmas and styles usually 10, forming a compound pistil. Fruits: Berry, nearly spherical, juicy, 1/4 to 1/5 inch in diameter, reddish-purple; seeds 10, oval, somewhat flattened, black, shiny. Habitat: Waste places, roadsides, low wooded areas, fence rows, stream banks, and farmsteads. Toxicity: All parts of this plant are poisonous to livestock. Birds eat the seeds without ill effects. Uses: Native Americans used pokeweed medicinally to treat arthritis and eczema and ate the young shoots after boiling it several times. Comments: At one time, the crimson juice of the berries was used as ink or dye, giving it the common name "inkberry". The foilage has an unpleasant odor. Pokeweed stems and leaves were worn by supporters of James Polk when he was a candidate for President.